Speed of light c in air can be measured either directly or indirectly. There are many ways to infer c with indirect measurements. For instance, we can measure the propagation delay of a signal through a coaxial cable (or an optical fiber) using the TDR analysis. With the length of the coax or optical fiber known, the speed of light can be calculated using the known velocity factor (or the refractive index of the fiber) and the measured propagation delay. Another example of indirect measurement is to measure the wavelength of a known frequency standing wave (e.g. a microwave signal) and derive the phase velocity of the electromagnetic wave in air. Direct measurement of speed of light is simple in theory. All that is needed is the measurement of time of flight of a pulsed light beam between two points separated by a known distance. In practice however, it is a lot more complicated. Due to the extreme speed at which light travels, the distance required is usually large (from tens of meters to distances between celestial bodies). There are two main reasons for this typical large distance requirement: the first reason is that the time resolution of the instruments. Because light travels roughly 0.3 meter per nanosecond (or roughly one foot per nanosecond), picosecond or even femtosecond time resolution is needed if the distance is just meters apart. The second reason is that precise measurement requires fast rise-time of the light pulse, both and the transmitting and the receiving ends. If the measurement distance is large enough, the error due to the accuracy of the measurements of the start and stop time can be ignored as long as the travel time is significantly larger than the signal rise-time. When the measurement distance is just several meters apart however, sub-nanosecond rise time for both the transmitter and the receiver is needed in order for any meaningful measurements. This is why we see a lot of indirect measurement experiments among the hobbyists but very few direct measurement experiments as it is difficult to build optical transmitters and receivers that meet this stringent rise-time requirements. Fortunately, an avalanche oscillator can be used to satisfy the fast rise time requirement of the transmitter. 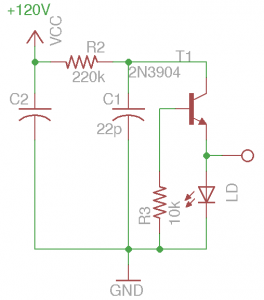 In this post I will concentrate on the transmitter portion of the circuit and in the next blog post I will cover the receiver circuit and some experiments. The avalanche oscillator circuit I used is very similar to the one I built a while ago. 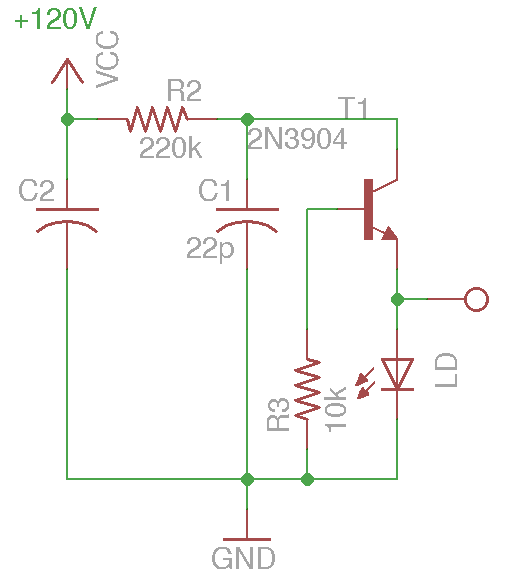 Instead of the 50 Ohm emitter resistor that properly terminates the signal output to BNC connector, a laser diode is placed directly between the ground and the emitter. Typically, a proper pulse operation mode rated laser diode is needed. But what I found is that those very cheap eBay 650 nm laser diodes used for laser pointers are suitable for this operation as well. The picture below shows one of these cheap laser diodes used in laser pointers. 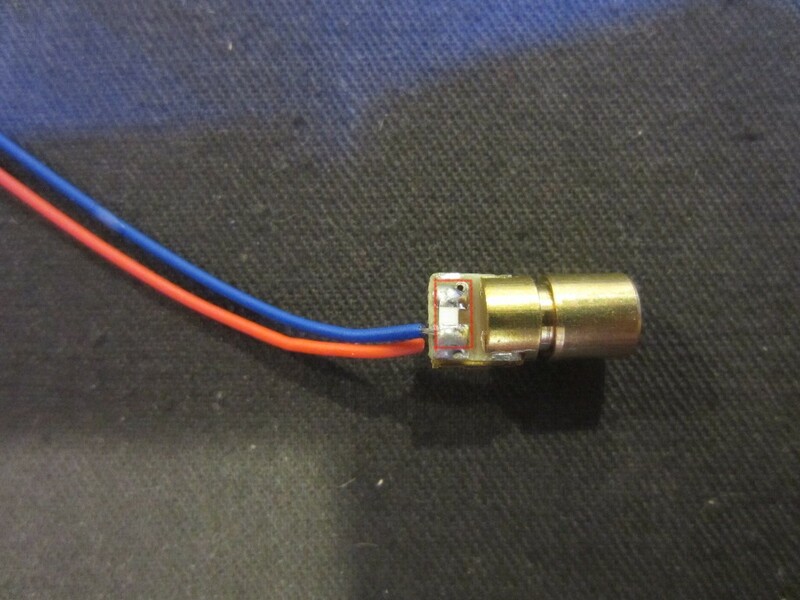 These cheap laser diodes utilize current limiting resistors (between 80 to 100 Ohms, highlighted inside the red rectangle below) instead of proper regulators. But this actually works to our advantage. The laser diode can be used directly (with the current limiting resistor) in the pulsed laser generator circuit. But what I found is that the pulses generated have sharper rising edge when the current limiting resistor is removed. You can simply remove the blue wire and re-solder it on the other side of the resistor (which in effect remove the resistor from the current path) without having to remove the resistor. This way you can always revert it to normal continuous use later. Alternatively, a pulse shaping network can be utilized (see example here) to produce more refined pulses. But for this application, the shape of the generated pulse is more than adequate. The avalanche pulse generator circuit shown above oscillates spontaneously, with a repetitive cycle of tens of microseconds. If more controlled repetition rate is needed, we can lower the supply voltage such that it is just below the threshold of the transistor’s avalanche breakdown. Then we can coupe in an external pulse to the base to trigger the avalanche breakdown at the rate of the incoming pulses. In the next post, I will discuss a receiver circuit that is capable of responding to such fast rising pulses and then conclude with our speed of light experiment.